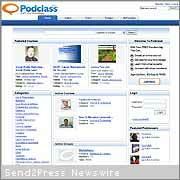 SAN DIEGO, Calif. — Podclass, Inc. announces Podclass Web Services (PWS), an application programming interface to enable online courses to be accessed from within Facebook(R) and other social networking sites. PWS enables users of learning management systems to access and manage course content, and to collaborate and interact with classmates from within Facebook. Learning management software systems such as Moodle, Blackboard, WebCT(R) and others are designed to facilitate online teaching and learning and are used for course management. In addition to colleges and universities, companies such as Google and Intel also use learning management systems for employee, vendor and partner training. For more information, visit: http://pws.podclass.com.